You know when people say ‘I lost my kid in a department store when they were little….’ Well, M tried to lose me at Nordstroms today. No joke. He saw a kid at a coloring table and waved me off. Granted, I could have looked better and I was patching concrete and powerwashing a porch earlier (or maybe I was just watching J and Tony do it….but I was still sweating). Speaking of that…I am tired. I’m tired of chasing kids around a house that ISN’T CHILDPROOFED. Oh the humanity! I didn’t know there were homes still like that. All clean and no crumbs anywhere. Fridges that didn’t have American cheese slices as a primary food group. Beds that were made and didn’t have random stains on them. I had to bring my own juice boxes (for Tony) and wonder where to change M. I don’t wonder where to change him at our house or even at Mom’s for that matter. Oh that Auntie Cait….she even has naked outlets. NAKED OUTLETS!!! Who does that?? But I digress. M was all ‘see ya’ and I had to beg him to come with me. Beg. With a Starbucks. Pretty sure my grandparents didn’t do that. EVER. (My, I’m into capitalizing lately). Once he had his bribe in his hands, we headed to Kansas Sampler. 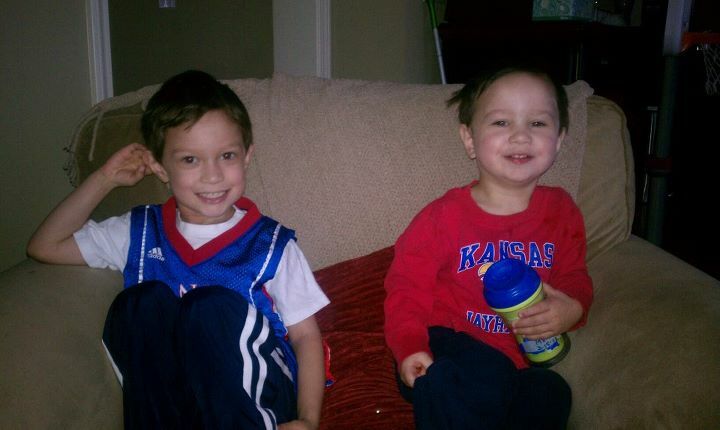 The boy didn’t have a Jayhawk shirt that fit. So…the injustice had to be fixed. Didn’t realize the entire city of KC was thinking the same thing. Except they were buying plastic signs that said ‘Rock Chalk this’. Who buys that? There was a conversation today between L and I where I had to explain why there are so many people being hit in the crotch on a silly little show called America’s Funniest Home Videos’. Who knew. I watched that show during my childhood and pretty sure I never asked why the parent never knew the kid with the bat near their netherr egions wasn’t a good idea. But L sure did. 6 times. He was judging like there were idiots. Smart kid. I bet he won’t buy a ‘Rock Chalk this’ sign when he’s my age. Fingers crossed. Either way, from asking me to rewind a ‘regular’ TV or asking me if his YouTube search was done….my boys are having a wacky childhood. Wacky with a capital W.
First of all, welcome back readers. Oh wait, that was me that was missing in action. It’s been weeks of nutty work stuff, tire eating, runny noses and birthdays. Luca turned 4 this week. To celebrate, we went to T-Rex. That child can NEVER say I didn’t throw myself in front of a bus for him. Actually, I would rather play chicken with an automobile than go back to T-Rex. Harsh? Perhaps. It might have been worse because I had a sweet headache and my youngest child acted like Sybil the ENTIRE time. Thankfully, my mom and sister love my kids enough to have tagged along and share in Sybil’s Teo’s fun antics. It was a great day for L, which is really all that mattered. Birthday donuts, cupcakes and singing at school and ice cream for dessert. But it’s my blog, I can complain. It has been 4 years since we became a family of 3 yet it feels like 3 months ago. My little babe has size 11 feet and wears a size 5. When did that happen? He is sensitive and cautious but he keeps us on our toes. The boy makes conversation like he is 34 and notices the most tiny of details. He squints with judgement….just like his momma. He says things like ‘I’m so exhausted’ or ‘Teo is making me crazy’ or ‘Are you sure about that?’ He imagines that pirates came over yesterday to jump on the jumpoline or that there are alligators eating our toes at dinner. Teo isn’t a giant fan of that last imagination play. He loves his brother but only on Wednesday and R days… or so he says. But Tater loves his bro and has sang Happy Birthday to him or yelled ‘Surprise’ every day this week. It still doesn’t get old. But my boy is….getting older. Bigger shoes, bigger vocab, bigger attitude. He gets it from his dad. The vocab is all me. Happy Birthday Lucas Anthony. You are the best thing. That was NOT the place to stand…. So L came home from school looking like a wet sad rag. He fell asleep 5 minutes after getting in the car (always an awesome sign) and didn’t wake up until 9pm. During his hibernation, M took full advantage of being a single child. Snuggling, Buzz uninterrupted, and a whole dinner of ranch, cheeseburger slider, yogurt and milk with no tattling on how much ranch just dropped off the floor. He was in heaven. It is always nice to remember how easy 1 child is. I hear crying from upstairs. M turns to me and says ‘Ca, tick. Go momma, he tick’. It was a total Lassie and Timmy in the well moment. We ran (M slowly climbed and sang ‘wheels on the bus’….we need to work on his sense of urgency) to L’s room. L was curled in a ball and sobbing. I brace myself to find a foreign substance or something else undesireable but nada. Whew. He asks me to hold him and I oblige. M finally arrives to see how his ‘ca is doing and could not have had worse timing. L yaks. M and I are caught in the cross hairs. That teaches me to not put on my good jammies until after kids are asleep and M needs to slap some quick on it, going up the stairs. ‘ewww, yuck Momma. ‘Ca sick on me. Eww. Wrigs, no, no, no’. Crap, the dog is all over this grossness and poor L has been stripped and shivering as I deal with the aftermath. The only redeeming part? L, as he is snuggling with me, tells M ‘Teo, I’m sorry I threw up on you. That was a bad choice.’ M? ‘Das ok, you ok?’. What stinkin’, yak covered, polite children I have raised. For those who don’t know…I am the oldest of 4. We are all married and 3 of us have kids. My parents went from having 0 grandkids to having 5 BOYS under 4 in as many years. Needless to say, our family dinners can be chaotic, loud, crazy and some of us are in various stages of undress. How’s that for a teaser?! For anyone who isn’t familiar with this crazy crew, I’m sure its intimidating. Hell, it might be why Cait never brought anyone home to meet us. Mom and Dad have set apart this time (Sunday nights) for family time. It is open to whoever can come…depending on firefighter schedules, retail schedules, naps, and general life stuff. We get a lot of comments like ‘I bet those dinners are sooo fun’, or ‘I would love to see those boys in action’. Tonight, everyone was in attendance except for J. All 5 boys were in good moods (rare) and fully clothed. Take notes on the clothing. Dad had made dinner and we started getting kid’s plates. This is a full assembly line which includes sippy cups, favorite chairs and berry delivery. They eat first and are done within 4 bites. That is 4 bites total between 4 boys… Cade eats like a grown man and then dabbles on everyone else’s plate. Slowly we start to lose kids to dinosaurs, Nana’s lap and the bathroom. We play zone defense. If a kid is in your zone, you are in charge of them. Period. No one escapes this rule. Not even Uncle Tony. The tattlers( the 3 oldest) came to tell us that babies were on the stairs, under the computer and playing in the toilet. All of those examples involved my kid. Who, by the way, now has his pants off as well as 1 sock. We clean up from dinner and the tattlers tell us M is eating crayons. This part happens twice. TWICE. For dessert, we decide to dip any food group into chocolate and then chaos ensues. Heads are colliding, toes are stepped on and magically, the 3 oldest now have no pants on. They are running from alligators in their chones (Spanish for underwear). Gotta love a 3/4 year old’s imagination. That is a sight to behold. We give the kids more sugar in the form of brownies and ice cream (it seemed like a good idea at the time). They start to fling themselves off ottomans and chairs. More head bonks and tears. I’m sure there is a correlation there somewhere. Nana’s name is called no less than 348 times between the 5 boys. “Gampa” is talked to just under 15 times, mostly to ask where Nana is. Poor guy. We all are chopped liver when it comes to the baby whisperer. There is always an audience when one goes to the potty. And then lots of cheering by all of the adults in attendance to the one who has peed.We all load up, give kisses, find lost socks, change diapers and search for missing kids who are later found behind toilets. Mom and Dad are wiped as are all the parents. I believe I said good bye to them but I can’t be sure. On the way home, M asked me about 40 times where Nana and “Gampa” are. L says ‘I love those guys’. Even with all the chocolate covered food, pee cheering and general high decibel screaming, I would agree.